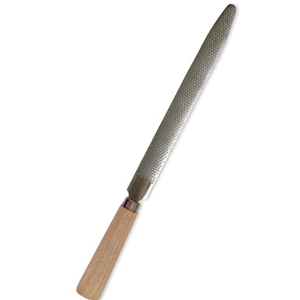 This imported hand-crafted carving rasp has a flat surface with a curved top surface. Uniquely, its fine teeth are punched not only on both sides of the blade but also into the edges of the exclusive design. Ideal for the fast reduction of large amounts of stone and wood. The blade is held with an octagonal shaped wooden handle secured by the tang of the rasp. Approximate blade length: 12" (30 cm).